From 20 to 22 April FLOCERT will be present at the Specialty Coffee Expo in Seattle (USA). The Coffee Expo is organized by SCA (Specialty Coffee Association), the world’s largest coffee trade association recognizing, developing and promoting specialty coffee by setting and maintaining quality standards for the industry. The event was designed as a one stop shop for coffee professionals and enthusiasts from over 75 countries across the world. If coffee is your business, your career path or your passion, the Specialty Coffee Expo is the show you need to attend to reach your goals in the industry. And if you’re interested in learning more how you can ensure your product is sourced in a fair and sustainable way and demonstrate your ethical commitment to your customers we are happy to meet you there in person. 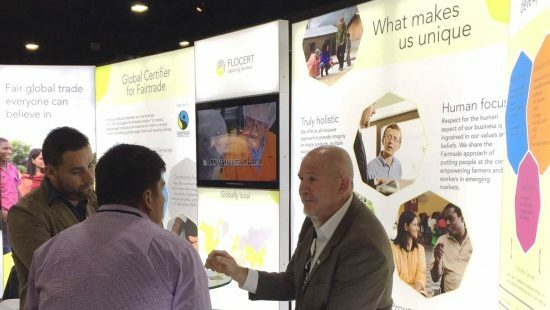 For three days, our experts will be present alongside Fairtrade America at booth #2601 to answer any questions about our certification and verification services. If you would like to schedule a meeting in advance, please contact us at business@flocert.net. We’re looking forward to meeting you at Specialty Coffee Expo!